IS 'WOW' (THE NEW WAY OF WORKING) REALLY WOW? IS ‘WOW’ (THE NEW WAY OF WORKING) REALLY WOW? The ‘new way of working’ also called the ‘new world of work’ (or ‘new WoW’), consists of a wide range of features. Innovations in the digital technology have led to an expansion in the use of IT to enable working anytime and anywhere. Telework is viewed as advantageous for both employers and employees for numerous reasons. One is the potential improvement of work–life balance, not least by the reduction in time spent commuting. In this context, the phenomenon of telework/ICT mobile work (T/ICTM) has been increasing, driven by the need of companies for higher productivity and improved performance, as well as by employees’ needs for flexibility, as they want to balance work demands with family and other personal responsibilities. It seems that the phenomenon is also being driven by social issues, such as pollution in the major cities. Teleworking is a great way to reduce commuting traffic and also office space expenses. It can create job opportunities, attract and retain qualified workers, and potentially even spark economic growth in remote regions. Most of these motivations are highlighted in national studies from France, Germany, Italy, the Netherlands, Spain, Sweden and the UK. In all these countries, telework – especially home-based telework – is becoming an increasingly important strategy for groups struggling to combine the daily use of time for various purposes at different locations. The ‘WoW’ basically refers to work that is independent of time and space, with the emphasis on working performance over working time or presence in the office. It requires a different approach to management, based on greater autonomy and self-responsibility for employees, as well as on good access to information, knowledge, experience and trust-based employment relations. One of the main drivers for adopting flexible work arrangements is an improvement of the work– life balance of employees. IT enables employees to better balance their work and personal life by eliminating commuting time and/or adapting their working hours to their personal needs. For companies, it`s also a way of improving the retention of employees. In Germany, for example, a company survey on the reconciliation of work and family life finds that improved family friendliness in companies is a major driver for managers to adopt flexible working time arrangements, including telework and mobile work schemes. Over four-fifths, (80.7%) of the companies surveyed stated that family friendliness was ‘important’ or ‘quite important’. The trend is towards individual agreements in the drawing up of working time arrangements. A study carried out by BITKOM highlights the fact that in addition to seeking to improve employees’ work–life balance, companies are aiming to achieve greater employee retention. Further reasons given by employees for adopting mobile work schemes included: better reconciliation of family and working life (86%), greater time flexibility (79%), higher job satisfaction (65%), and no commuting (63%). Another important driver for the development of teleworking is clearly the advances in information and communications technologies that have occurred in recent years. While home-based telework has been a convention for decades, so-called ‘new ICT’ such as smartphones and tablet computers have revolutionized work and life in the 21st century. Crucial result of this development is the detachment of work from traditional office environments. Smartphones, tablets and similar devices enable not only traditional forms of telework (working from home or home-based telework), they also facilitate working on the move and working from any location. The use of ICT to perform work outside the employer’s premises is also linked to the extension of the use of flexible working time arrangements. Since ICT enables spatial and temporal flexibility, those workplaces where flexible working time arrangements are developing can also be a solid ground for remote working. Occupations and work tasks increasingly involve communication and the transfer of knowledge and informational products, symbols and services over great distances. For these reasons, jobs and tasks have gradually become more appropriate for teleworking. This trend is still strongly associated with higher status occupations in the advanced service sector. Despite this development, several factors delay the actual adoption of T/ICTM by organizations, regardless of the available technology. For example, in some countries and organizations, the culture of work makes organizations reluctant to introduce telework and other types of flexible work while employees can hesitate to use those options even when they are available. In addition to managers’ willingness to support working from home, other factors include levels of trust between managers and employees, self-perceived job sustainability, workplace interaction needs, and the availability of office space and equipment at home. Managers may resist teleworking especially in high power distance countries because of their inability to control or monitor physically dispersed subordinates who by telecommuting also reduce their dependence on them. Interestingly, according to the national study for Belgium, employers with experience in adopting teleworking appreciate its advantages more than those who have not yet had that experience. This finding suggests that some employers might be prejudiced against teleworking. 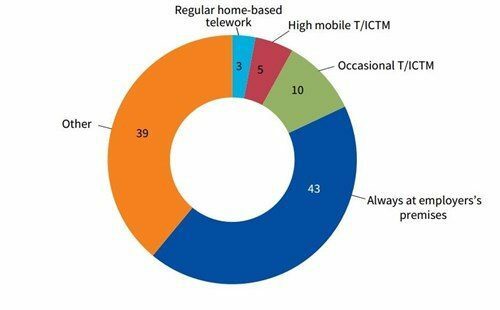 In the EU in 2015, about 3% of workers mainly did regular home-based telework, about 5% did high T/ICTM and about 10% did occasional teleworking. In total, about 17% of employees were doing teleworking. Among the 10 EU countries included in the Eurofound study, a higher proportion of employees in the Scandinavian countries use ICT and work outside the employer’s premises. Other EU countries with a relatively high share of workers performing teleworking are Belgium, France, the Netherlands and the UK. Four of the countries included in this study fall below the EU28 average: Germany, Hungary, Italy and Spain. The results of the survey conducted by European Foundation for the Improvement of Living and Working conditions suggest that the effects of telework are ambiguous and perhaps even contradictory. Mobile working entwines many aspects of our work-life management, and to understand it, we need to approach it from different angles. Does it bring a clear advantage compared to the traditional office environment? How easy is it to implement it? What can we do to improve it? Can we establish open-minded, strong, and trustworthy relationships from our remote environment? The main advantages of teleworking reported by employees are a reduction in commuting time, greater autonomy in working time organization, better overall work–life balance and higher productivity. Each advantage goes a long way, if your workers are satisfied they will excel at sales and in the end, bring profit to the company. The equation is simple: happy workers = happy customers = happy business. Some disadvantages of teleworking with which workers seem to struggle the most are its tendency to extend working hours, create an overlap between paid work and personal life due to a blurring of work–life boundaries, and the intensification of work. It appears that many of these ambiguous effects are related to the ICT use, the specific work environments and/or the characteristics of different occupations. The importance of implementing telework solutions, both from a financial and human resources view, have been widely documented. Despite these inherent benefits, many organizations still are hesitant to implement telework, often because there are many doubts as to how to manage workers remotely. Before launching a telework program, each organization should determine a teleworker’s technology needs, so he/she can be just as sufficient working remotely as he or she would be in the main office. At first, it seems that today the most basic tools of a teleworker are only two things: the internet and a computer. Well not exactly, considering the management’s highest concern is the fear of having less control over employees who work from home, and not being able to reach a teleworker when you need them. These issues can be easily resolved with an online workspace. Here is where Awingu steps in. Awingu enables a highly secure access to company applications and documents on any device, also the devices owned by your employees (Bring Your Own Device, BYOD). Our solution offers collaboration tools that make file sharing, real-time editing and online collaboration as easy as sharing a link. As for the “control”, Awingu offers a granular and secure user access rights and detailed auditing stats of user sessions. 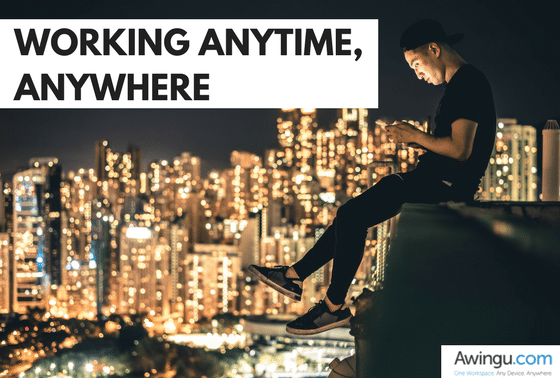 Check out more about how Awingu can help in our guide “Why you should consider working remotely?” or start a 14-day free trial! NOTE: The European Foundation for the Improvement of Living and Working Conditions (Eurofound) is a tripartite European Union Agency, whose role is to provide knowledge in the area of social, employment and work-related policies. Eurofound was established in 1975 by Council Regulation (EEC) No. 1365/75, to contribute to the planning and design of better living and working conditions in Europe.